OK, so you live in Barcelona or you are visiting Barcelona on your holiday or vacation. You want to keep fit or you want to get fit. Where do you start? Google “exercise in Barcelona” and you will get a long list. There are many options here in this vibrant and diverse city, but who can you trust? Since living here in Barcelona, I have noticed that the control of qualifications in the fitness and exercise industry is much more relaxed than in the UK and other European countries such as Germany. That is a problem for someone looking to find a trainer because you have no idea what quality of qualification they have, or even if they have a qualification at all! This does not just apply to individual trainers. I know of clubs and fitness centres here who use unqualified staff. So you can not simply join a club and think you will get professional treatment. You should always ask for qualifications before you start to work with a personal trainer or in a group fitness exercise session. If you choose Barcelona Bienestar, you can relax. We only use fully qualified trainers who we have personally checked out. Our main personal trainers and group exercise trainers are Julia and Chris. Julia is from Russia. She is fully qualified in fitness, exercise, Pilates, Pilates EVO and group training. She is the current Miss Ireland Bikini Fitness Model so you know that she can train hard! Chris is from London, England. He is an international trainer of fitness teachers. He travels the world (Russia, Brazil, America, Germany, Sweden, Finland, Denmark, Italy, France, Latvia, Ukraine, Poland, Switzerland, China, Japan, Holland). He is also the creator of Pilates EVO and bodyFUNC training systems. So if you are looking for professional, qualified fitness exercise trainers in Barcelona, then you can trust Barcelona Bienestar. We work in Spanish, English and Russian. So this is the craze that is sweeping the world and has gone viral. I was challenged so naturally I had to go ahead and tip a bucket of ice water on my head. To be honest, by the time the filming started the ice had melted but the water was still pretty damn cold on a hot August day in Barcelona! Just so we don’t forget what this is all about, it a way to raise money and awareness for Amyotrophic lateral sclerosis (ALS), which is also referred to as motor neurone disorder (MND), Charcot disorder, and, in the United States, Lou Gehrig’s disease. It is a neurodegenerative disease with various causes. It is characterised by muscle spasticity, rapidly progressive weakness due to muscle atrophy, and difficulty in speaking, swallowing and breathing. ALS is the most common of the five motor neuron diseases. One of the famous victims of this disorder is Stephen Hawking. As well as donating to the charity, I am also having a special Pilates session on the beach in Barcelona this Saturday 30<sup>th</sup> August where the cost is 20€ but all the money will be donated by me to the charity. I hope to see you all on the beach in Barcelona for some charity Pilates! And keep the ice-bucket challenges going: Robert, Jessica and Maria, I am waiting! 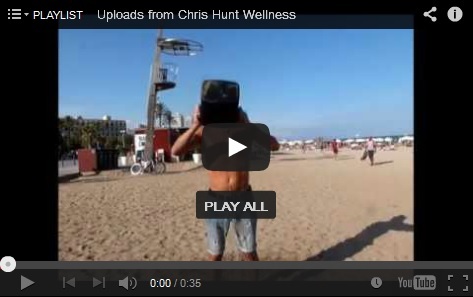 Chris is an international Pilates presenter and educator based in Barcelona, Spain. He is the creator of <a href=”http://www.pilatesevo.com/”>Pilates EVO©, </a>bodyFUNC©, and CEO of Pilates Rehab Limited and Sport Core Strength. He also organises Pilates Carnival and Fitness Carnival, conventions where all profits go to local children’s charities. For more information about Pilates with Chris in Barcelona, please click on <a href=”http://www.barcelonabienestar.com/”>Barcelona Bienestar</a>. To learn more about Chris, please read <a href=”http://www.chrishuntblog.com/about/” target=”_blank”>Just who is Chris Hunt anyway?</a> You can also subscribe by completing the form on the this BLOG to receive articles and special offers straight to your inbox. Chris pays 50% of any money made from this BLOG to his charity partners, the other 50% covers the costs. More details can be found by clicking on www.chrishuntwellness.com and selecting the “charity partners” tab.